According to the National Turkey Federation, 88% of American families eat turkey on Thanksgiving. That’s over 46 million turkeys! Served as the main dish, it is complemented by a variety of sweet and savory side dishes, many of which are family traditions made from recipes passed down through the generations. Why do we eat turkey on Thanksgiving, anyway? Well, it’s kind of a funny story. While historians generally agree that turkey wasn’t eaten at the First Thanksgiving in Plymouth in 1621, it was well-documented that settlers often hunted wild turkeys as a source of protein, and subsequent celebrations often included turkey. After President Lincoln declared Thanksgiving a national holiday in 1863, turkey became a staple on many Thanksgiving tables. When choosing a turkey, there are a few decisions to make. How many people will be eating? Will it be roasted, smoked, or deep-fried? Is frozen or fresh preferred? When it comes to the proper size, a pound per person is a great rule of thumb. This includes the total weight of the bird, not just the meat. Also, the ratio of white meat to dark meat is about 7:3 (70% white meat, 30% dark), so if there are a lot of dark meat lovers around the table, additional thighs and drumsticks may need to be purchased. Roasting is the most common way to cook a turkey. This method involves placing the turkey in a large roasting pan and cooking it in the oven slowly over several hours. The turkey is usually placed breast-side up in the pan and basted periodically to prevent drying. The lid or foil is also removed the last 30 to 45 minutes of roasting time to brown the skin and give the turkey that gorgeous presentation. Vegetables such as potatoes, carrots, or Brussels sprouts may be added to the roasting pan to cook concurrently. 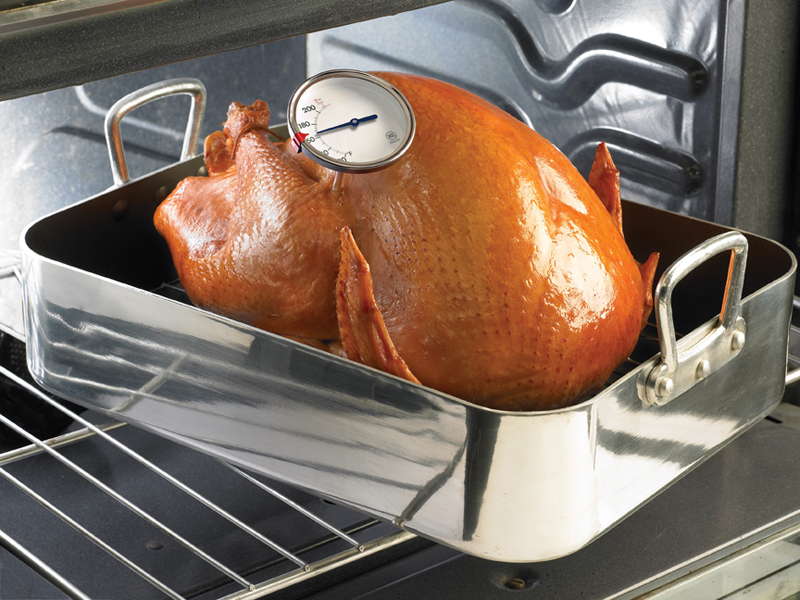 For best results, roast the turkey at 325˚F for 15 minutes per pound. For example, a 15 pound turkey would take 3 hours and 45 minutes. Smoked turkeys are usually fully cooked (read the label to be sure) and just need to be reheated. Keep in mind, smoking is done to impart flavor and does not increase the turkey’s shelf life. Follow the instructions on the package to properly reheat the turkey. Deep-fried turkeys are submerged in very hot oil and cook more quickly than roasted turkeys. Turkeys can be deep fried in a very large stockpot or in a designated turkey fryer. Only use enough oil to cover the turkey. Too much oil can cause a fire or overflow when the turkey is added to the cooker. To determine the amount of oil, place the turkey in the cooker and add enough water to cover the bird. Then remove the bird. The water line will indicate the level of oil needed to adequately fry the turkey. For best results, let the turkey warm to room temperature before frying, and fry the turkey for 3 minutes per pound plus 5 minutes per bird. Remember, the size of the cooker will dictate the size of the turkey. The turkey should fit easily without being forced. Wedging a turkey into a cooker that is too small could cause uneven cooking, or worse, a fire. As for frozen versus fresh, there is no difference in flavor. However, frozen turkeys can be purchased months in advance and kept frozen until needed. Fresh turkeys should be purchased no more than two days in advance for maximum safety and freshness. The safest way to thaw a frozen turkey is in the refrigerator. This will take pre-planning. The general rule of thumb is 24 hours of refrigerator thawing per 5 pounds. For example, a 15 pound turkey should take 3 full days (72 hours) to thaw completely. However the turkey is cooked this year, have a Happy Thanksgiving! Q. Approximately how long should you allow for thawing a frozen turkey in the refrigerator? A. 24 hours per each 4 – 5 pounds of turkey. In it’s original wrapper, place the frozen bird in the refrigerator (40˚F or below). To prevent cross contamination, be sure to place the turkey in a container. A thawed turkey can remain in the refrigerator for 1 – 2 days. Q. How long should I cook the turkey? Q. 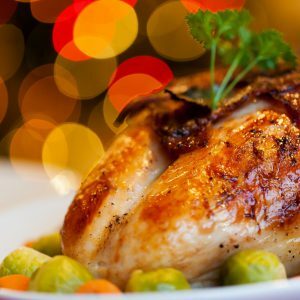 What is a safe internal temperature for cooking a whole turkey? A. 165˚F. 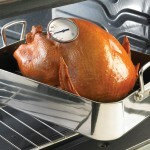 Use a food thermometer to check the internal temperature of the turkey. Insert the thermometer in the innermost part of the thigh and wing and the thickest part of the breast, making sure not to touch the bone. All turkey meat, including any that remains pink, is safe to eat as soon as all parts reach at least 165˚F. Let the turkey stand 20 minutes after removing from the oven. Remove any stuffing and carve the turkey. Q. What is the recommended temperature for stuffing? A. 165˚F. The stuffing should reach 165˚F whether cooked inside the bird or in a separate dish. Q. I want to stuff the turkey. How do I do this safely? 1. Cook any raw meat, poultry, or shellfish you plan to use before stuffing the turkey. Do not mix wet and dry ingredients until just before stuffing the turkey cavity; wet ingredients can be prepared ahead of time and refrigerated. 2. Spoon stuffing directly into the cavity right after preparation. Stuff loosely – plan for ¾ cup of stuffing per pound. The stuffing should be moist, not dry – bacteria is destroyed more quickly by heat in a moist environment. Do NOT stuff turkeys to be grilled, smoked, fried, or microwaved. 3. Cook the turkey immediately in an oven no lower than 325˚F. 4. Use a food thermometer to make sure the temperature of the turkey AND the center of the stuffing have reached a safe minimum internal temperature of 165˚F. 5. Let the cooked turkey rest for 20 minutes before removing the stuffing and carving. Q. How long can I keep leftovers? A. Refrigerate all leftovers within two hours after cooking. Divide cooked foods into shallow containers; this allows the center of the food to cool more quickly and evenly. Use within 3-4 days or freeze for longer storage. Be sure to reheat hot foods to at least 165˚F; sauces, soups, and gravies should be heated to a rolling boil. Source: Avoid Guessing About Holiday Food Safety, University of Nebraska-Lincoln Extension.